Today is the great bluesman Jimmy Johnson's 90th birthday. I last saw him just over a year ago in Chicago, where he was the musical highlight of the trip, and at 88, still equally compelling as a singer and guitarist. Johnson's repertoire includes classics by B.B. King and T-Bone Walker, but the primary influences on his tough, minor key-driven blues were his West Side Chicago peers Magic Sam, Buddy Guy, and the recently deceased Otis Rush. (He toured Japan with Rush in 1975.) To say that Johnson is one of the last of the best of the Mississippi-born Chicago bluesmen is to state the obvious. Listen to him here in 1975, two years before he made his first blues record, singing the B.B. classic, "It's My Own Fault, Darlin'," and feast on the sound of one of the most impassioned, high-pitched tenors in blues history. Jimmy Johnson was born James Earl Thompson in Holly Springs, MS, on November 25, 1928. He moved to Chicago in 1950 and worked as a welder before setting his sites on music at the end of the decade. In a 2017 interview following his induction into the Blues Hall of Fame, Jimmy said he bought his first guitar in 1958 from a neighborhood friend, the harmonica player Billy Boy Arnold. He paid $35 for a Kay, the line that was sold through Sears-Roebuck. He added that "what really inspired me to play was Magic Sam lived next door to me." He enrolled at a music school in "downtown" Chicago where he learned the fundamentals including "polkas and waltzes," then took lessons with Rocky Boyd, the blues guitarist and session player who also taught Matt Murphy, Fenton Robinson, Lacy Gibson, and Luther Tucker. Jimmy's brothers include the soul singer Syl Johnson, and the late bassist Mack Thompson, who worked extensively with Magic Sam. (Speaking of siblings. Jimmy's always struck me as a brother-from-another-mother of the late cowboy actor Ben Johnson.) Syl's success motivated Jimmy to adopt the Johnson surname, and like his brother, he sang and played piano in gospel groups before persuing a career as a soul singer in the '60s. He played guitar and sang backup with Otis Clay and Denise LaSalle, and made a single of his own, but the results were modest. In an interview with Bill Dahl for the Chicago Sun Times two years ago, he said he changed his focus to blues in 1974. "That's when that field I was in had died," he says. "You ever hear the word 'Stop whippin' a dead horse?' Ain't no use to keep whippin' a dead horse if there's another horse that's still living. And I knew Buddy Guy and Junior Wells and them, James Cotton. Man, they were making a lot of money." Within a few years of his conversion from r&b to hard-nosed blues, Johnson's full-throated style as a singer and fluid, understated guitar playing earned him the nickname, The Barroom Preacher. In this clip of Jimmy singing "As the Years Go Passing By," he tells the audience, "Y'all have to forgive me for playing all these slow blues, but that's my groove." 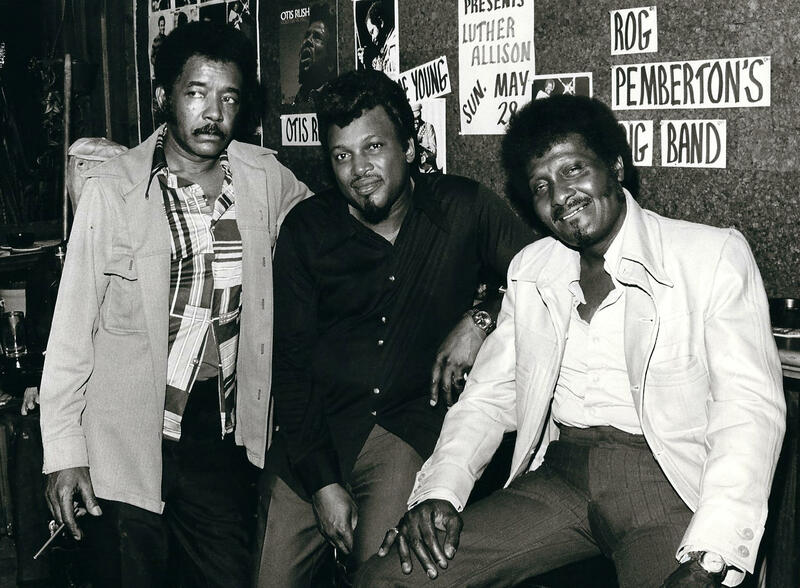 The late '70s was highlighted by the emergence of the Fabulous Thunderbirds and Roomful of Blues, revived careers for Albert Collins and Son Seals, and the relocation to New York of the great, though little-known Texas bluesman Johnny Copeland-- an event that Robert Palmer described in The New York Times as "too good to be true." Jimmy Johnson's arrival on the national circuit was another signal of renewed vitality in modern blues. Jimmy debuted with four titles on the Alligator Records series, Living Chicago Blues, then made his first album, Johnson's Whacks, for Delmark in 1979. It's takeaway song was "I Need Some Easy Money," a hard-nosed depiction of life for a struggling urban bluesman. Johnson's career was sidelined for five years following a 1988 tour van accident that injured him severely and left him grief-stricken over the deaths of two of his bandmembers. But he returned to form in 1993 with a major label release on Verve and a European tour in which he made this TV appearance in Germany and sang the Wilson Pickett classic, "Midnight Hour," and the title track of his new album, I'm A Jockey. Johnson still plays out around Chicago, and his website lists about ten gigs for December. As he told Dahl, "I really enjoy being onstage entertaining people. I've had enough of the road. [But] you see me at home playing all the time." 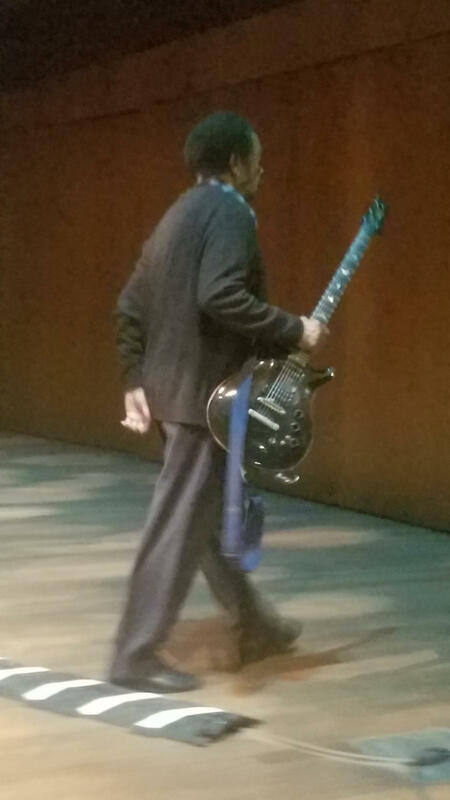 Here's a picture I took of Jimmy leaving the stage of the Logan Center at the University of Chicago on October 21, 2017. After moving a packed house with no-nonsense takes on "Cold, Cold Feeling," "Heep See," and "Ridin' in the Moonlight," he took a bow and made a quick departure that spelled, "Through for the night."